Every animal has a story. 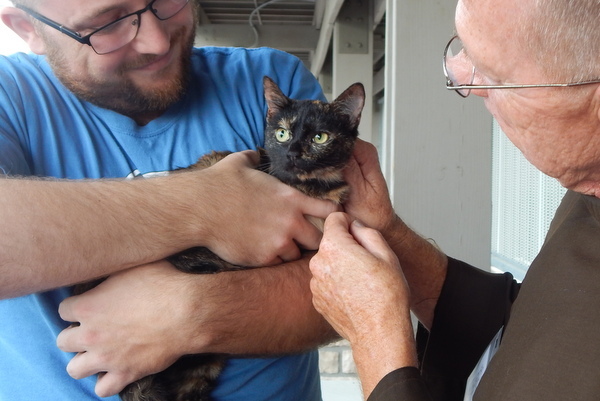 That's what five friars learned October 6 when they volunteered for the province's first-ever pet blessing at Cincinnati's SPCA adoption center in Sharonville. Friars Tim Lamb and Bill Farris set out that morning to bless as many of the 800 rescued dogs, cats and small anivals as they could. 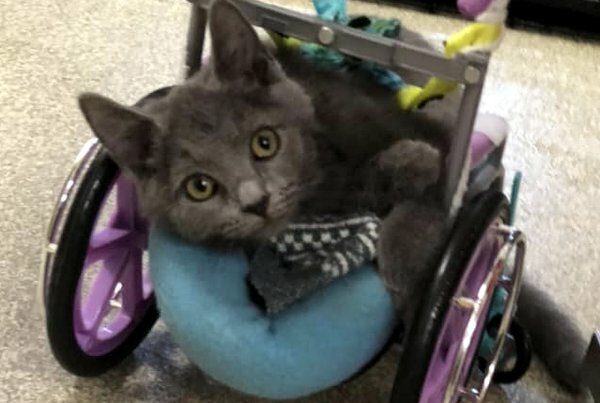 Along the way they heard tales of abandoned and abused cats and dogs in all stages of recovery, including Jordan, a 4-month-old gray kitten who is unable to use her front legs but can propel herself around strapped to an American Girl doll wheelchair. They prayed over kennels of dogs with special needs, rooms with bottle-fed kittens and pooches headed for a mobile adoption event. "We ask a blessing upon all these animals as they go forth," Br. Tim said. "May they find loving humans who will care for them." Fr. Bill was impressed with the shelter's medical care, "the approach to the varying needs of abandoned pets, and special sections for those too young to go on to the next level." Br. Tim was encouraged by "the care volunteers give the animals. It's heartening to see people take the time to care for the big ones and little ones." At noon, friars Tim Sucher and David Crank joined Br. Scott Obrecht out front for the public pet blessings. Br. Scott explained the connection to the Feast of St. Francis. "The respect he had for creation is the respect we try to instill in others." Tille, blind and deaf in one ear, loved all the attention. For two hours they blessed fish, cats, dogs, and one stuffed animal - all of who had a story. The fish were terminally ill. Joanne Queenan brought an aging retriever she took in after the owners divorced. 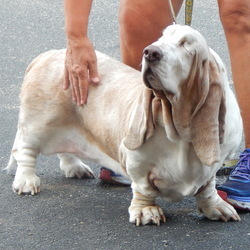 Everyone's favorite was Tillie, a sweet-tempered basset hound blinded by glaucoma and deaf in one ear. She gets around fine, thank you. 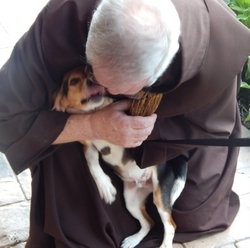 Happily, they blessed a number of new adoptees like beagle puppy Bumper, who wriggled with joy on the way to his new life. Out for a birthday excursion a family took home Trinity, a golden-eyed tortoiseshell kitty with three legs. Everyone involved was sure St. Francis would approve. This story first appeared in the SJB News Notes. See more photos of Pet Blessings around the province on our Flickr page. 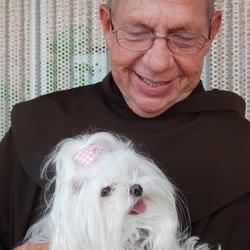 The Friars of the Franciscan Monastery to the Holy Land made a video of their Pet Blessing. Br. David says goodbye and good luck to three-legged Trinity, on her way to a loving home.